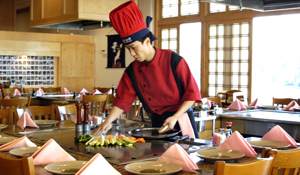 Nagoya's has been serving Japan's best traditional dishes to Ashburn Area patrons since 2002. Our menu highlights very artfully arranged sushi, fresh grilled seafood, vegetarian fare and classic Japanese dishes. 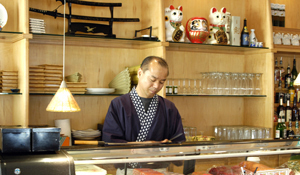 Expert sushi chefs can create sushi and sashimi to order for enjoyment at the sushi bar or at the Tepanyaki grill. 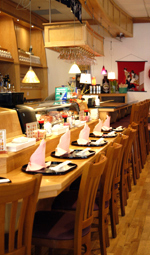 Nagoya's restaurant is available for private parties, banquets and holiday events. Please contact us by phone at 703.723.9703 or at 703.723.9704 for additional information or to make reservations. The Nagoya sushi bar prides itself by serving only the freshest ingredients. Complement your meal and order a beverage from our full service bar. 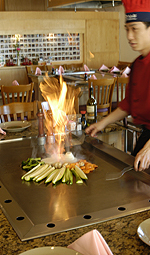 Our restaurant also features eight Tepanyaki grills staffed by our experienced chefs. Take a night off from your own kitchen, and let our courteous staff serve and entertain you.